Endocarditis, also called infective endocarditis (IE), is an inflammation of the inner lining of the heart. The most common type, bacterial endocarditis, occurs when germs enter your heart. These germs come through your bloodstream from another part of your body, often your mouth. 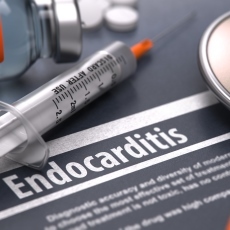 Bacterial endocarditis can damage your heart valves. If untreated, it can be life-threatening. It is rare in healthy hearts. The signs and symptoms of IE can vary from person to person. They also can vary over time in the same person. Symptoms you might notice include fever, shortness of breath, fluid buildup in your arms or legs, tiny red spots on your skin, and weight loss. Your doctor will diagnose IE based on your risk factors, medical history, signs and symptoms, and lab and heart tests. Early treatment can help you avoid complications. Treatment usually involves high-dose antibiotics. If your heart valve is damaged, you may need surgery. If you're at risk for IE, brush and floss your teeth regularly, and have regular dental checkups. Germs from a gum infection can enter your bloodstream. If you are at high risk, your doctor might prescribe antibiotics before dental work and certain types of surgery. Article: A man with fever and breathlessness.